Venue Address: Las Vegas, U.S.A.
EDS is the premier annual event for the main players in the international electronics industry. Every year, the manufacturers of electronic components, instruments and accessories, as well as distributors and manufacturer's representatives, come together to meet, make contacts and build their businesses. 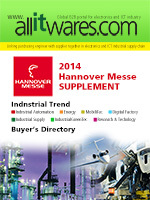 Suppliers of industry goods and services also are on hand to market their products. EDS is an combined effort and strongly supported by the industry's top member organizations — the Electronic Components Association, the Electronic Representatives Association, and the National Electronics Distributors Association.